What’s on the cards for Sandton Central in 2019? With any new year comes an abundance of opportunity. Opportunity to start fresh, open a new chapter, reflect on the year gone by and establish a plan of action moving forward. 2019 is ahead of us and it’s promising for all. We see Sandton Central not as a nameless, faceless entity, but as a vital component of our city. We consider ourselves part of a bigger picture, one aimed at fostering sustainable growth and contributing positively to our surrounding areas. Because of this, we welcome the new year much the same as anyone else would, with similar room for reflection, introspection and direction. Before we move forward, however, we need to look at how far we’ve come. As the saying goes “you can’t know where you’re going if you don’t know where you’ve been”. This year was monumental for us as we commemorated our nations favourite son. It’s bittersweet to look back in admiration knowing full well the magnitude of his contribution. Madiba was truly an icon, not just for South Africa, but for hope and determination. 2018 marked the centenary of this great man’s birthday, and in celebration we saw some iconic events in his name. Madiba understood this. He warned us about this… If we are serious about universal freedom today…. then we have a responsibility to do something about it”. This ties in to his belief that distribution of wealth should be equal and fair. This, among other anecdotes, provided valuable food for thought on the current socio-political climate in South Africa, and we are privileged to have had the opportunity to witness it. We also saw the launch of the iMadiba project, a global interactive and participative project aimed at generating conversation for change. There was also the Kaya FM Legacy Walk and, of course, the much-publicised Global Citizen concert. Sandton Central itself saw massive developments, adding an astounding 132,400m² to the existing space offerings. We also initiated the first of two planned Rea Vaya stations to be completed early 2019, which can be found along Katherine Street and Atholl Square. In the interest of safety and convenience, the district also oversaw the implementation of pedestrian push buttons at numerous intersections. 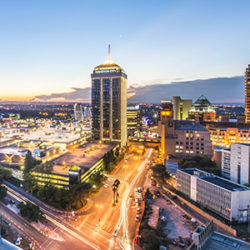 The #iLoveSandton photo competition was launched and saw two promising photographers walk away with awards. The Nelson Mandela Square opened the official Sandton Joburg Tourism Visitors Info Centre and, of course, Sandton hosted the Women for Change Run this December in support of 16 days of Activism. In conclusion, it’s been a busy but productive year, with lots of change, positive growth and contribution to causes aimed at making our country a better place. Final registration weekend for our 2019 Elections on the 26-27 Jan 2019. We’re currently in the process of launching the Sandton Central Precinct, with the City’s partnership in rolling out CCTV cameras for your added safety. Furthermore, you can expect the addition of a Tourist info kiosk at the Sandton Gautrain Station and, lastly, completion of the Leonardo and new Bidvest Bank Offices. That’s quite a lot of info to process, but we’re constantly striving to build on our existing infrastructure to leave a lasting impact on our beautiful city. We can safely say that whilst 2018 was certainly fruitful, we are anticipating an even better 2019.